My friend Judy Gile always said that foliage season in Vermont peaked on October 9, and Vermont generally complied with her wishes. Judy had that effect on the world around her. From our home in Sherwood Forest, not far from Burlington and Lake Champlain, we claimed a view of Camel's Hump and the hills and valleys of hardwood forests leading up to it. I particularly loved to gaze down over the town to see the mist rising above the river and the Round Church gleaming stark white against a backdrop of orange, wine, and the occasional splash of red. Closer to home, the trees along our road formed a yellow canopy over our frosty morning jaunt to the bus stop. On Saturday mornings, we walked through the covered bridge to the football field. Mt. Mansfield presided in the distance, brilliant foliage lined the river, and the clang of the cowbell signalled each Wolverine touchdown. Later in the season, we kicked the snow at our feet and huddled under blankets while we cheered. The anticipation of hot chocolate by the wood stove kept us warm on the inside, at least. In addition to football, we are also a Macintosh family. Every year I had to remind myself to wait past first frost for the Macs to grow red and sweet. Then, on a sunny Saturday morning, we rambled through the orchard with our wagon, brown bags full of drops for applesauce and half bushel bags for smooth pie apples. The scent of fresh cider donuts eventually pulled us out of the trees. 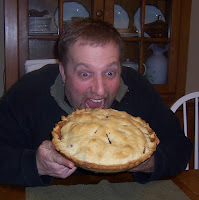 Then we piled in the car, apples at our feet and crumbs on our smiling lips, anticipating the first pie of the season. I miss New England autumns, bursting as they are with homebaked coziness and the tingle of promise. However, though I love first snows, I do not miss the long winter that follows. Those Vermont winters made the move to the belly of the country a little easier. 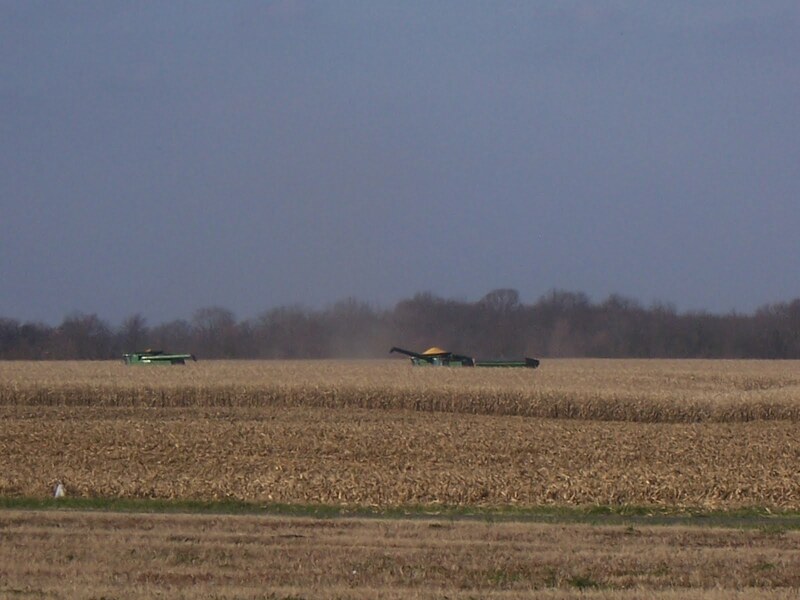 Few people travel to central Illinois for the lush scenery. Still, a misty autumn morning holds promise with or without hills rolling with color. 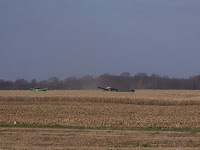 The huge harvesters lumber down the farm road outside my kitchen window, reminding me that my horizon now filled with fields of brown corn will transform overnight. That right there is what I love about autumn. No New Year's resolutions for me. In the dead of winter, I would rather curl up next to the fire and read. But autumn...now that is the time for change. I send the kids back to school, dizzy with the possibilities before me. Then I open my journal, watch out the window as my horizon expands before my eyes, and plan my dreams into focus. You inspire me! I want to write beautifully but I always disappoint myself. I'm going to take a stab at it; beats the unfinished projects that have been hounding me all day. Check my FB post later. Beautiful! I especially love the "no New Year's Resolutions for me" line. I have always loved the change from winter to spring most. Something about going from barren gray cold to color and things striving to grow has always moved me. Still, your love for autumn pours through your piece and makes me see new hope at this time, not just the prospect of cold flatness. I probably could use this reminder now more than ever.